Remember the story about the ugly duckling? You know, the poor little thing who was a bit unfortunate looking but when given a chance and a bit of time was a real beauty? Well today our little ducks name is Sunchoke. Or more formally, Jerusalem artichoke. You’ve never heard of the poor little thing have you? It’s okay. Don’t feel badly. We’ve only become acquainted, and I admit, it was a confusing and a rocky start. The confusion starts at the name. 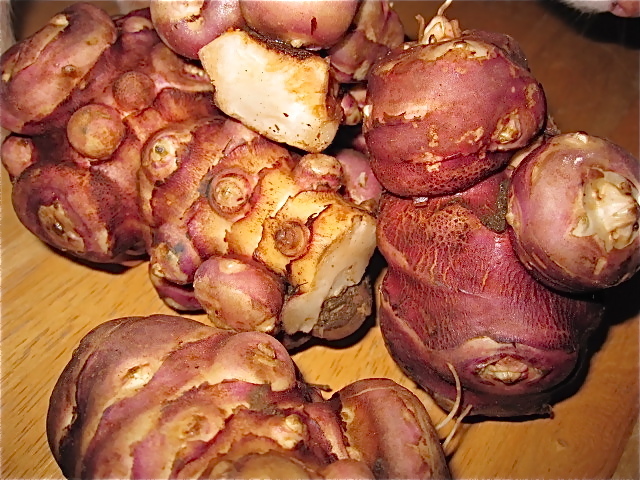 Sunchokes are sometimes called Jerusalem artichokes. And, as if two names wasn’t enough they are neither from Jerusalem or have anything to do with artichokes! They are actually a tuber from the sunflower family (hence the name sunchoke). The sunchoke is an exceptionally hardy perennial plant (meaning they don’t have to be replanted every year) that was apparently very popular during World War II thanks to food rationing. It is a good source of carbohydrates and a natural source of insulin. You may not find them at your regular big box grocery store, but try looking in the smaller neighbourhood grocer or at your local farmers market. If you are anything like me you probably have seen them before and it just didn’t register. I’m still in learning mode with sunchokes. Research tells me that they are good raw, cooked, roasted, boiled and pickled. To date I’ve roasted them like a potato which I thought was okay, but not a huge fan, and I’ve tried a soup which was quite good but still needs some more work. My best recipe occurred the day I wanted to make hummus and realized I was out of chickpeas (the horror!). I was searching through my fridge and found some chokes sitting sad and lonely (there’s the poor ugly duck again….). Well, “why not” I thought. 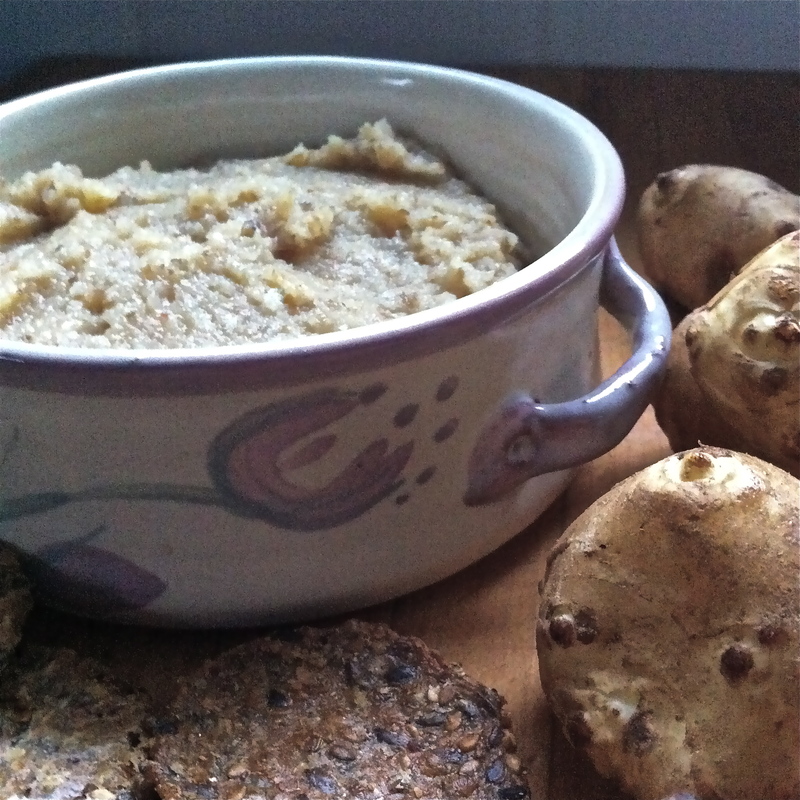 Here is my favourite variation of a roasted sunchoke dip that I’ve tried so far. Please let me know what you think and if you have a more well developed relationship with the vegetable than I let me know! Wash the sunchokes and place in a large mixing bowl. Pour just enough olive oil over the chokes to very lightly coat each one. Generously sprinkle with sea salt. Line a baking sheet with parchment paper*. Place chokes on the tray and place in oven. Bake for 30-45 minutes depending on your oven. You should be able to easily pierce it with the end of a knife. * Note. If you don’t have parchment paper, not to worry. It is used to help the pan be more of a non-stick surface but doesn’t change the roasting. I often don’t use it. This of course is apparent by the state of my pans. 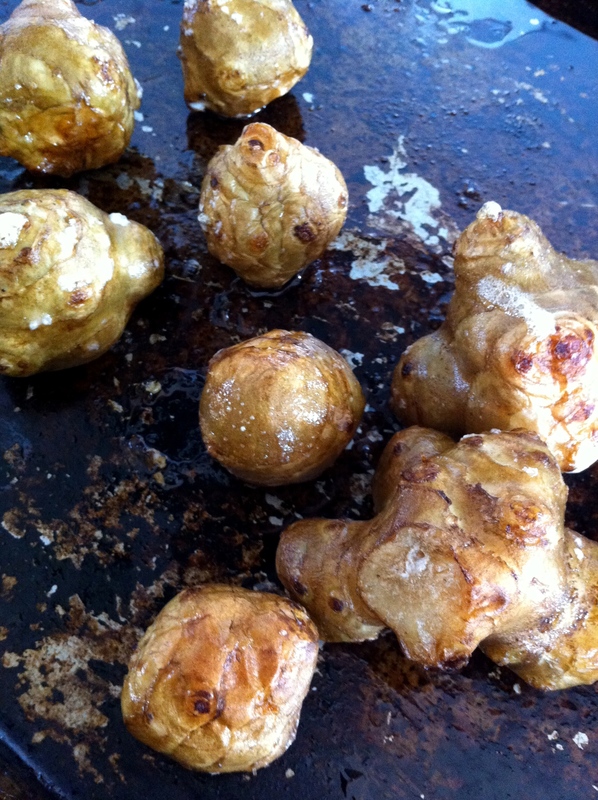 Let the sunchokes cool. Roughly chop them. Place all in a food processor. (If you use a blender instead it will work but won’t be quite as easy. You will probably need to chop them smaller to start and then add a bit more liquid). Add olive oil, lemon juice and chili garlic sauce. Blend until smooth(ish). If you find it needs more liquid I often drizzle a bit of water in while blending. Enjoy with a dense multi grain bread, crackers or cut vegetables. This entry was posted in Appetizer, Cooking techinques, Food, Lunch, Recipe, Vegetables, Vegetarian and tagged chili garlic sauce, jerusalem artichokes, lime, olive oil, sea salt, sunchokes by mostlynoodles. Bookmark the permalink. Fantastic idea. I just tried sunchokes for the first time this week, raw in a salad. They were delicious – crunchy and not too sweet. I have some sad-looking ones in my fridge now, too. I’ll roast them and try this! I still haven’t tried them in a salad yet, maybe coleslaw? Hope the roasting worked out!